Home #WHERETONEXT Europe At Adler Thermae, Walking + Culture + Food = Bliss! At Adler Thermae, Walking + Culture + Food = Bliss! 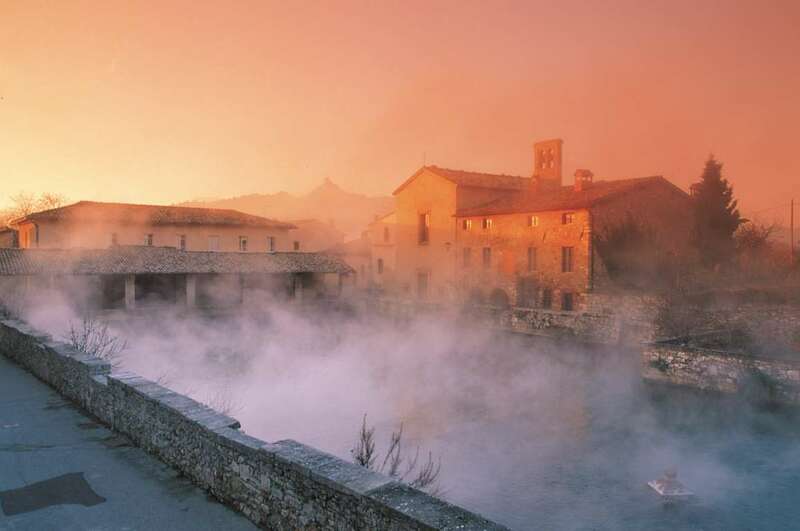 It would be easy for a guest at ADLER Thermae Resort & Spa, the groundbreaking five-star hotel fed by the Bagno Vignoni’s thermal waters, to be tempted to check in for several days and never leave the property. After all, the baths, saunas and pools cover 1,000 square feet of the property, and the spa menu has more than 120 treatments, including carefully customized facials performed with signature ADLER products and massages using techniques such as craniosacral and Ayurveda. But they would be missing out on one of the most distinctive things about the hotel: Its breathtaking location in the Val d’Orcia, a UNESCO World Heritage site. 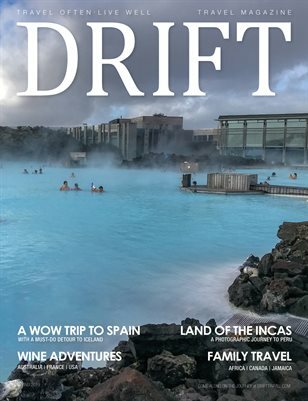 Adler Thermae offers the perfect home base for exploring the area through half-day excursions led by local guides—which still leave plenty of time to luxuriate at the spa. Visitors who’ve booked “Enjoy Tuscany” will have the chance to take a morning cooking class taught by a local home cook (or “mamma”) at Tenuta Sanoner, the hotel’s hilltop winery. After working in the kitchen, they’ll savor their creations during lunch on the terrace overlooking the valley. They’ll also experience a tasting in the wine cellar featuring local varietals, cheeses and meats. Not only will they return home relaxed and full of fabulous food, they’ll have new recipes in their cooking repertoire and everlasting memories of Tuscany. Another highlight of the package is the Adler Luxury Aetos Ritual treatment, which is designed for couples. A detoxifying peel is followed by a soothing massage using grapeseed oil. Next comes a regenerating bath in mix of the hotel’s thermal mineral waters and local red wine, which is rich in antioxidants. To further engage the senses, the treatment concludes with a glass of sparkling Aetos Rosé and a taste of wine-aged pecorino cheese. 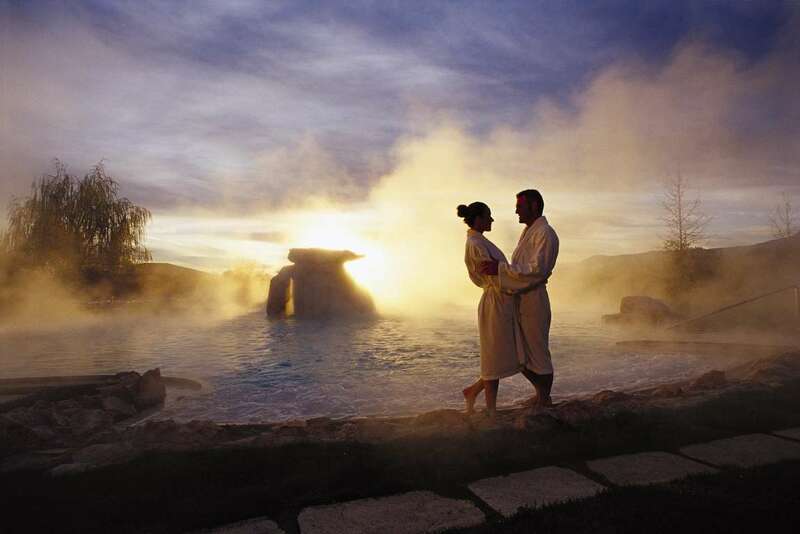 1 ADLER Luxury Aetos ritual for two: a luxurious wine therapy ritual with a cleansing dermatological peel, relaxing massage, a regenerating bath in thermal water and final tasting of Aetos wine and pecorino cheese. The “Explore Tuscany” offer gives guests the chance to be active with local hikes and walks, which are especially pleasant during spring and autumn. Led by local guides, visitors will climb the rolling Tuscan hills and have the chance to see some of the area’s most famous sites, including the Abbey of Sant’Antimo, the Abbey of Monte Oliveto Maggiore, and the Vitaleta Chapel. Should they prefer to cycle, they’ll have complimentary access to the hotel’s fleet of mountain bikes and electric bikes. Other excursions might include the classic Renaissance towns of Pienza, with its famous cathedral and Papal residence, and Montepulciano and Montalcino, known for their namesake wines. Finally, gourmands will appreciate the chance to meet some of Tuscany’s renowned artisanal producers, and they’ll be able to taste wine, olive oil, cured meat, saffron, pasta and cheese. Depending on the season, they also will be able to see ingredients like herbs, fruit, vegetables and truffles growing in their natural environment. The perfect partner to a week spent hiking and biking? A €100 spa voucher for each guest, so they can decide which treatment will best soothe their sore muscles.